I have several pets who have both skill sets opened, but I can't seem to trigger the skill swap. I've tried clicking on them and dragging them to try to swap them, I've tried click on the little up & down arrows in the middle, I've tried clicking on one and using the up/down arrows on my keyboard. Nothing is working. What do I have to do? I am not sure I understand. You have the pets in an active team and can't choose which skills you want them to use? What arrows? 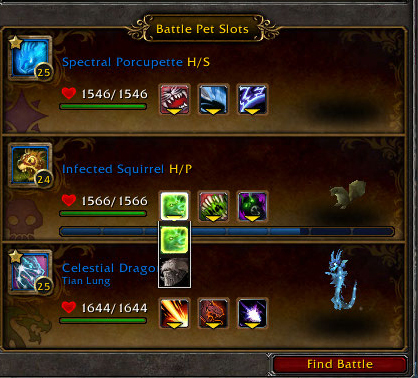 Here is a picture showing how to swap a pet's skills. As you can see, I have clicked on the first skill of the pet in the second slot of the active team. This makes a drop down menu showing both skills available. I can then click on which of the two I want to use. Edit: Replaced the URL with the image. Last edited by Maizing on September 1st, 2014, 8:05 pm, edited 2 times in total. Ohhh!! Thank you thank you. That was it. Don't know why I didn't see that before. Much appreciated!